Are you new to the virtual world and struggling to make it big on this platform? This problem tends to arise when you are a newbie because there are over 100 million websites present all over the world. There is a lot of competition over the platform. So, what’s next? The solution to the problem lies in the basic principles of Digital Marketing. Digital Marketing refers to advertising delivered through the online platforms such as search engines, social media, email and mobile apps. It involves principles that aim at promoting your online business in order to get more sales or click on your website. A lot of options are available over the internet to help blossom your business. Here we going to tell you about some tools you must use whether you are a newbie or an expert. These tools will help you take your business to a new level and the results will be visible in a short period of time. Let’s have a look at them one by one. This is a free tool which helps you to identify a wide range of keywords and calculates the number of average searches for you. As on-page SEO plays an important role in indexing your website on Google, so this tool helps you in searching a unique keyword for a given article and stand apart from your competitors. While writing article for your website you need to know about the readability and SEO of the article. This is a must have tool for on-page SEO. It helps you analyze your article to a whole new level. It comes both in free and premium versions. Free version has some limitations which can be overcome with the premium subscription. It is an e-mail marketing tool that helps you send thousands of emails at one go. If you need to build an e-mail list, then you should give it a try. In MailChimp, you can create newsletter forms for your website and there are a variety of templates available. It also allows you to create campaigns to send newsletter or information about new products to your customers on daily basis. It also has both free and premium versions. Free versions come with limited functionality, while the premium one has a lot more options available. Sprout Social is a Social Media engagement platform that helps businesses to make a better engagement with customers via Social Media networks. It helps to measure the effectiveness of your efforts on different Social Media Networks. It comes with a 30-day free trial. And if you wish you can purchase the premium services for just $99. Google Analytics is a freemium service provided by Google to analyze the daily traffic of your website. You can add up-to 400 websites in one Google Analytics account. It helps you recognize your potential customers and identify the main source of traffic for you so that you can work towards in the right direction making it better with time. HootSuite helps you boost your online presence by scheduling you post for various social platform via a single tool. In today’s world, Social Media is one of the biggest platforms that help you register your online presence. There is a lot of competition over different Social Media platform and it can be time-consuming to post and maintain your presence over several networks at a single time. So, HootSuite helps you schedule your post for the day, weeks and even for a month. Social Share Plugin for WordPress helps users to share posts from your website to Facebook, Twitter, Google+ and over 100 other Social Networking websites. It is the simplest tools available for sharing your posts. It also provides you with free icon customization feature. It is one of the best because it is mobile responsive. 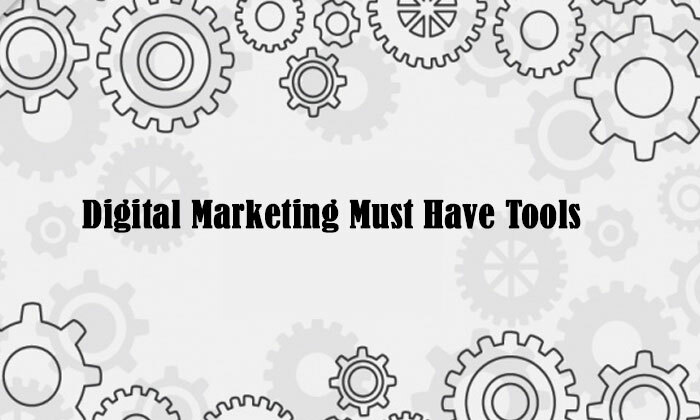 No doubt there are thousands of Digital Marketing tools available, but the ones mentioned above are must have in order to grow your business online.